Bacteria and Foot Health: Frontline Documentary Explores How Antibiotics Are Contributing To The Rise Of "Superbugs"
November 12, 2013 /0 Comments/in Foot Health & Hygiene /by Jenn F.
Did you happen to catch the new Frontline documentary covering the rise of antibiotic-resistant “superbugs”? If you missed it, you can catch the whole 53 minutes here, on the PBS website. In the past, ailments like strep throat or a scraped knee could kill a person. Health experts warn that we may be on the verge of such widespread death once again. CDC Director Tom Frieden said that superbugs resist most antibiotics and can actually spread resistance to other types of germs in the body. Roughly half the people who get bloodstream infections caused by these silent menaces die from them. How Big Is The Problem Of Superbugs? Journalist David Hoffman told NPR that, according to CDC statistics, more than 2 million Americans are infected with a resistant type of bacteria and about 23,000 people die from it each year. He said that many people are familiar with methicillin-resistant Staphylococcus aureus (MRSA), but most people are not aware of drug-resistant bugs like carbapenem-resistant enterobacteriacae (CRE), acinetobacter baumannii (Acinetobacter), pseudomonas aeruginosa (P. aeruginosa), and clostridium difficile (C. Diff). Ten years ago, we didn’t see any of these pathogens. Today, they are in 40 states and they are making their way through some of the most highly regarded hospitals in the nation. You may also come into contact with these germs while swimming in the oceans or traveling abroad. In the 1950s and 1960s, antibiotics were considered miracle drugs. The unintended consequence was that bacteria learned to adapt for survival — teaching each other how to swap enzymes and figure out how to beat the best antibiotics we could produce. The infographic below reveals that 190 million doses of antibiotics are administered in hospitals each day and another 133 million annual prescriptions are written by doctors — but 50% of these antibiotics are given out needlessly. Often times, the symptoms of bronchitis, flu virus, sore throats, and sinus infections mimic bacterial infections, so the prescriptions are written — even if an antibiotic can’t treat the root cause of the problem. What Is Being Done About Superbugs? “We really have a big information black hole about these really, really dangerous bacteria, and we need to know more, and it ought to be a national priority,” Hoffman says. Part of the problem in researching these bugs is that they can resist antibiotics by pumping them out or by building an armored shell around themselves. Their ability to resist, survive, and teach other bacteria how to persist is impressive from a scientific standpoint, but also very terrifying. According to the documentary, part of the problem is that there are very few players in the world of medical research who are willing to work on developing new antibiotics. During the eighties and nineties, pharmaceutical companies began to back off antibiotic research because there was no money in producing short-term drugs — compared to life-long medications for chronic conditions like heart disease or diabetes. Pfizer was one of the last companies pursuing cures for gram-negative bacteria, but they decided to scale back research & development and close a UK infectious disease research lab employing over 2,000 people in 2011. 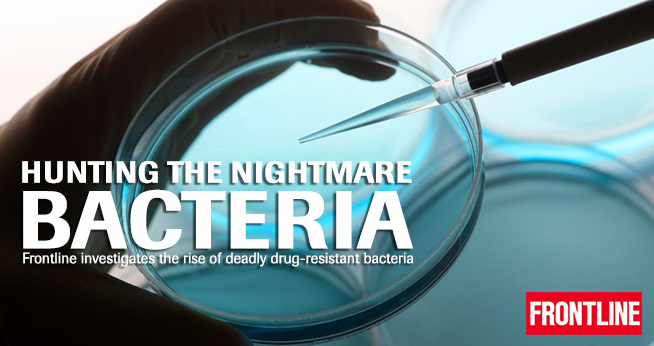 Last year, the FDA initiated a new task force to deal with the problem of drug-resistant bacteria, but is it too little too late? The documentary warns that there is a tremendous loss in knowledge when these closures occur and new teams are basically starting at the drawing board. In the meantime, there are several steps you can take to protect yourself from dangerous bacterial infections. Spend a good 15 seconds washing your hands with soap and water (but skip the antibacterial soap). Ask your doctors to wash their hands if you don’t actually see them do it, and inquire about alternatives to antibiotics. Get the flu shot to keep your immune system up during the most vulnerable months of the year. Also, be sure to inspect your feet for open sores each day and use the SteriShoe UV shoe sanitizer to prevent bacteria from festering in your footwear, which could become a cauldron of superbugs over time without proper UV light sanitization.